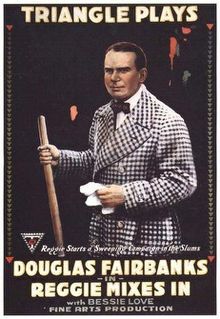 This early feature starring Douglas Fairbanks demonstrates his continuing development of his screen persona after “The Lamb” and his ability as both an actor and an acrobat. Produced by D.W. Griffith’s Fine Arts Film Company and directed by longtime Griffith associate and repeat Fairbanks director W. Christy Cabanne, it also shows the adaptation of the “gangster movie” to Fairbanks’s particular mix of action and comedy. 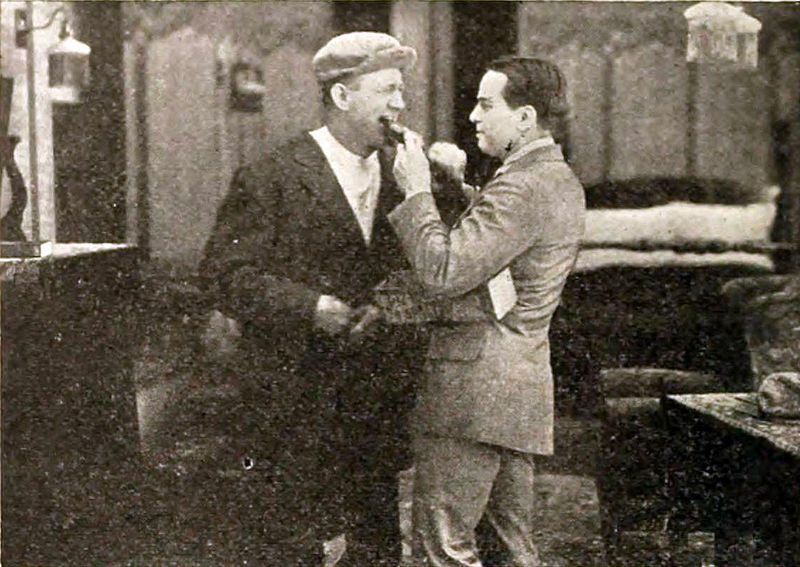 Fairbanks begins the movie, as he does in “The Lamb” (and the later “Wild and Woolly”) as a young, athletic, and handsome heir to a fortune with no particular ambitions in life. We see him sleeping in till noon and being harassed by his butler (who he calls “Old Pickleface”) to get up for breakfast. Once out of bed, he leaps over a table and does headstands, just to make sure we know he can. He takes a call from his girlfriend, a very posh-looking Alma Rubens, under his blanket in bed. She’s coming over for a party later, which motivates him to get dressed for company. At the party, she flirts with another man, but doesn’t accept his proposal for marriage, to Doug’s relief. Doug then proposes, and she accepts – Intertitles tell us that she was always more interested in his money – and he seems to have second thoughts. Later, Doug and Old Pickleface are out for a drive and find a waif in the gutter who says she’s “losted.” Charmed, Doug pulls her aboard the car and drives her to her tenement home. We see him play with the child and try to break up a domestic squabble before he sees the girl of his dreams come down the stairs. It’s Bessie Love (still a teenager at the time), who is dancing at a place called “Gallagher’s” for pay. Of course, Doug decides he’s going to need to pay a visit, and he’s smart enough to dress down a bit to make the right impression. Despite this, he drags Old Pickleface along, maybe for moral support. They manage to get served, after Doug stops being polite and pounds his fist on the bar, and they meet the bouncer, who decides they’re OK. Tony, the head of the gas house gang (William Lowry), comes in and demonstrates his ability to push patrons around, and the bouncer talks tough but takes no action. When Tony tries to make a move on Bessie, she shows more interest in getting to know Doug at first. But when Tony roughs up the bouncer and another gangster fires his gun, Doug leaps up to hide in chandelier, and Bessie concludes that he’s chicken. He proves her wrong later by chasing the gangsters away when they try to strongarm Bessie into a car. After this display, the owner of the dance hall hires Doug to be his new bouncer, now he has an excuse to come by every night and get to know Bessie. He gets a good reputation at the bar for keeping order, and is able to fend off several efforts by the gang to put him out of the way. In one case, Doug climbs the front of a building to leap down on his assailant in an alley. Meanwhile, his Aunt is of course worried about the company he’s keeping and his neglect of his regular social calendar. He comes to a costume ball with his old crowd, dressed up as a bouncer from a dance hall, and gets complimented on his originality when he shows off the dance moves he’s learned on the job. He again sees Alma with her boyfriend, and now he gets the picture and shuns her company. She sends him a note remonstrating against his neglect, which Doug foolishly leaves on a table for Bessie to find. The gangsters make another play for her and when he intervenes, Tony challenges him to a one-on-one fight in a locked room, instructing his sidekick to scrag Doug with a “gat” should he fail, The fight involves several chairs thrown out windows and broken tables, and Doug gets his clothes torn up, but emerges a victor. Before the other gangster can shoot him, the owner shuts off the lights and Doug escapes with Bessie out a broken window. The police raid the joint and presumably take several gangsters into custody. Finally, Doug has to figure out how to marry the girl he loves. He arranges to send a false note telling her she has inherited $100,000 so that she’ll come to a party at his Aunt’s house. He meets her outside in his bouncer clothes and asks if she would marry him and leave all this wealth behind. She says yes. Then, he sneaks into the house and puts on his tuxedo. 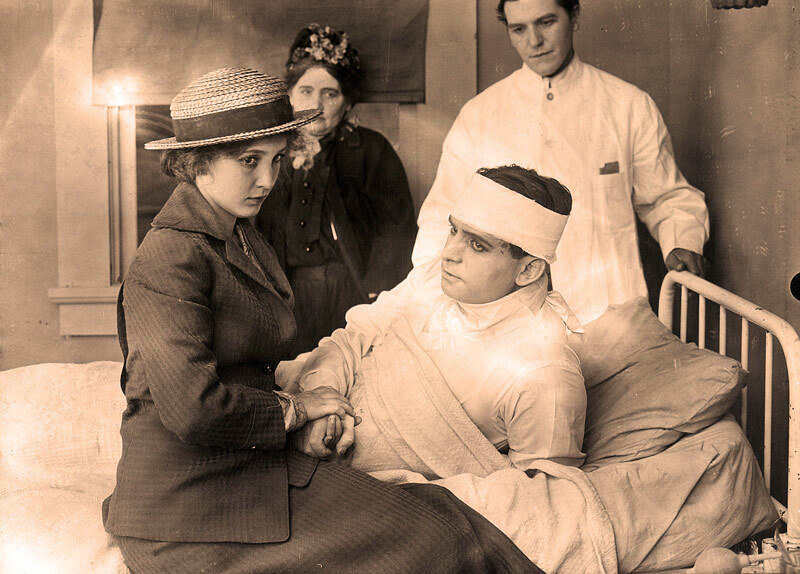 While Bessie is trying to get out to meet her sweetheart the Aunt says “You must meet my nephew, Reggie.” Now she sees him in his real clothes and true element, and he knows that she’d marry him whether he had money or not. They live, as we assume, happily ever after, once Doug explains that she isn’t really an heiress. This movie has somewhat more of Fairbanks’s signature stuntwork and fighting than “The Lamb” did – presumably audiences were coming to expect it by now. I particularly enjoy his penchant for going up (chandeliers, buildings) when people expect him to run or fight. He obviously enjoys his acrobatics, he always has a gleeful smile on his face when he gets to do one of these moves. The story here is pretty contrived, and even for 1916, the characters and situations are cliché. The fact that it’s at least half comedic makes up for this to some degree. I was surprised by the sparseness of the sets, particularly in the “rich” setting of Reggie’s Aunt’s mansion, and there are very few camera movements or other creative uses of the space. It didn’t help that the print I saw was old and washed out. There are a lot of close-ups, however, and we see good use of inter-cutting at moments of emotional impact, as when Bessie finds Alma’s love note. Perhaps not a major contribution to the cinematic art, this is a good piece of light entertainment with a talented performer at its center. I have been unable to find this movie for free on the Internet. If you do, please let me know in the comments.